Die heute an Gusswerkstoffe gestellten Qualitätsanforderungen sind komplex und hoch. Deshalb muss die Qualität der aus diesen Werkstoffen hergestellten Bauteile fortwährend überwacht werden. In einzigartiger Ausführlichkeit werden diverse Gefüge vorgestellt und deren Nutzen in der alltäglichen Praxis beschrieben.Today the quality demands on casting materials are complicated and on high level. Therefore, the quality of the components made of these materials has to be continuously monitored. In addition, the structure of the respective material with all its specific features is one of the most important quality signs.While the results of the most testing methods can be displayed as measured data, casting structures must be described and be interpreted, i.e. 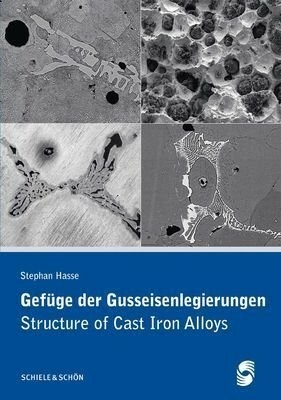 there must be a description as to which phases exist within the structure, in which amount and shape they are distributed and which properties have to be expected.The present book describes and explains the most important cast iron structures and its specific features for experts dealing with castings in foundries, casting-using and similar industries to make their work easier in this field. Beside the description of the structure which is expressed in more than 300 figures. This seems very important, because beside the normal structure components, primarily structure-specific features influence the expected properties of real casting alloys.Therefore, according to the state-of-the-art not only optical microscopic figures are shown, but a huge number of scanning electron micrographs are displayed and described. In addition, EDX analyses are also presented as unequivocal proof of structure components.Many professional book describing single/ special structures have been written, but there is no work in this magnitude. Nevertheless, recognising, indicating and deducing from that the adjusting of the desired structures is a basic requirement for quality assurance. That is why in keeping with todays global requirements the book will appear in German and in English. 2007. 212 Seiten/ pages. 21,4 x 30,0 cm.